Assalam o Alaikum. 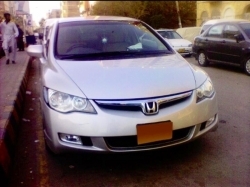 . . Honda Civic Vti 1.8 i-Vtec (Reborn). Prosmatec Transmission. (Automatic) Hard Top. Silver Metallic Color. New Yokohama A-Drive Tyres were Recently Installed. New Advanti Rims installed. Multimedia System with Navigation. Fully Maintained Car. Fully Petrol Driven. Low Mileage Only "38000 km" done. Tax Paid upto Dec-2014. Used as a Family Car. Car is in Original Condition as you seen in pictures were attached. It is a Second Owner Car. CPLC Cleared. Serious Buyers Can Contact. Sorry for the Brokers & Dealers. So Kindly Don't Waste My Time. Price will be Little Bit Negotiable. Regards, Bilal Ahmed. Honda Civic 2001 VTI Oriel, Prosmetic, Blue Color, Excellent condition, Body Kit (Extended Bumpers and Sideskerts), converted to UG (Leather seats and door panels), Expensive Alloy Rims, CNG Installed Last Year before that was used on petrol only Exhaust of good sound! New Shape, Negotiable, Offers are welcomed! This sporty new Honda Civic possesses rare spirit. See, touch, feel, drive and discover. Navigation and Entertainment System in Civic â€œOnlyâ€ Navigation, iPod Connectivity, MP3 Audio & DVD Video Player, USB and SD Card Support, Blue Tooth Connectivity, On-Screen Dial Pad, Rear View Camera. Everything is included in this package.